The club has been lucky to have some very instrumental figures over the years. People who have played key roles in ensuring our safe passage to where we are now. Life Memberships are only awarded to people who are no longer in service with the club and are given out at our annual awards. 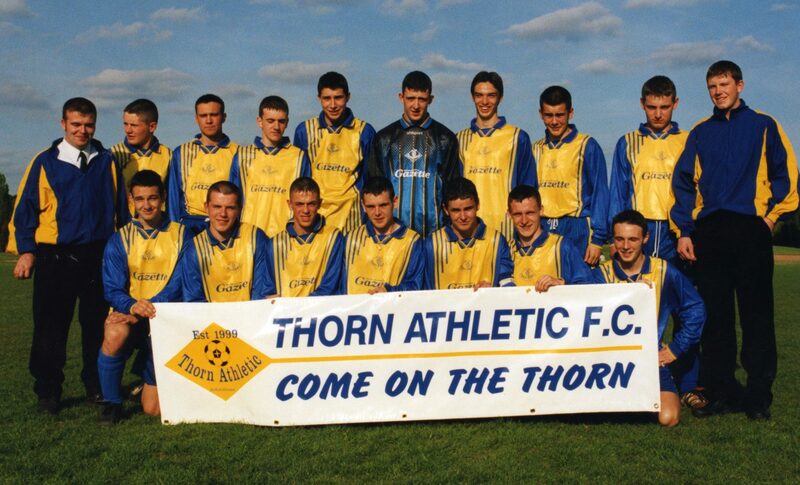 They recognise extraordinary service and achievements with Thorn Athletic. It’s hard to sum up Jim’s contribution in just a few lines. After reluctantly agreeing to help not long after his son Jamie joined the team, he gave the club more than a decade of the most dedicated service imaginable – enjoying unparalleled success. Having spent many years running other well-respected local clubs he reignited his passion for the game – and the passion of those around him – to lead the team to an unprecedented quadruple that included a West of Scotland Juvenile Cup. His formidable contribution was felt in every aspect of the club’s development and in many ways he defined the club and the principles which it prides itself on to this day. One of only a select few who have left a legacy at the club. He will forever be held in the highest regard by all he worked with. Jim is recognised for his work with the club at an event in the Town Hall. A formidable player and highly-respected coach, there have been few more welcome additions to the club than Hugh McCrystal. Recruited by Jim Allen – the rest is indeed history. Hugh brought with him a dedication and work ethic that was completely new to us. His straight-talking and organisation, together with his flawless preparation and a knowledge built up over decades in the game, helped him deliver the Thorn to a new level. His relationship with us has grown and developed during several spells of association. A constant rock. His remarkable ability to identify what is needed at the right moment is a talent none know better. A true friend of the club on many levels and someone, like Jim, who leaves a legacy of success that will be appreciated for years to come. 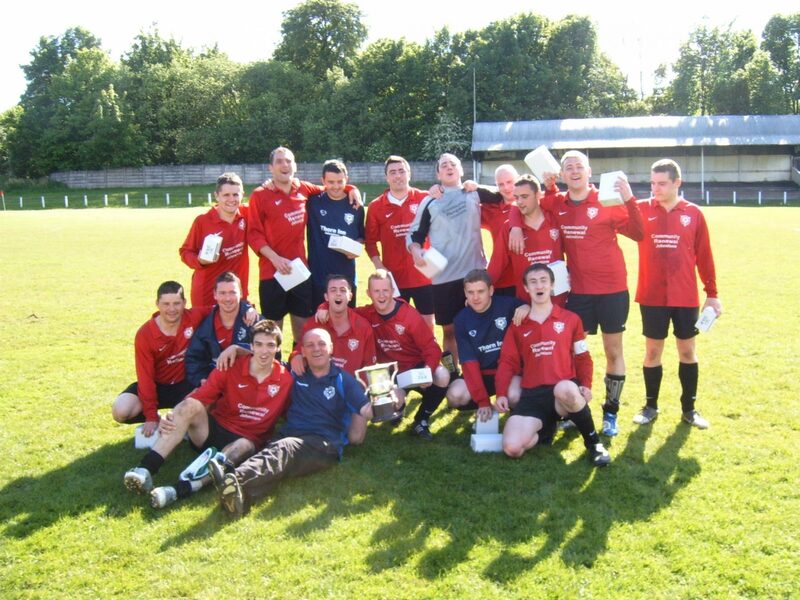 Hugh in amongst the players after one of his many fine moments – cup final success at Keanie Park. Robert joined the club in the very early days after his son Stuart initially signed to be later followed by brother Brian. He formed part of a small but close-knit committee that got the club off the ground in the late 1990’s and early 2000’s. He was involved in most things around the club for the best part of our years in youth and juvenile football. 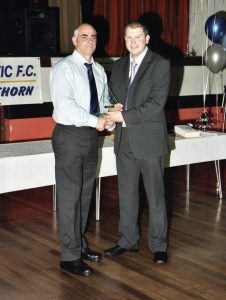 His spell at the club saw him witness our first silverware in the Paisley & District League and many trophies thereafter in the West of Scotland Under 21 League as the team went from strength to strength. He is still a regular traveller with the team on our away days and retains a keen interest in our fortunes. 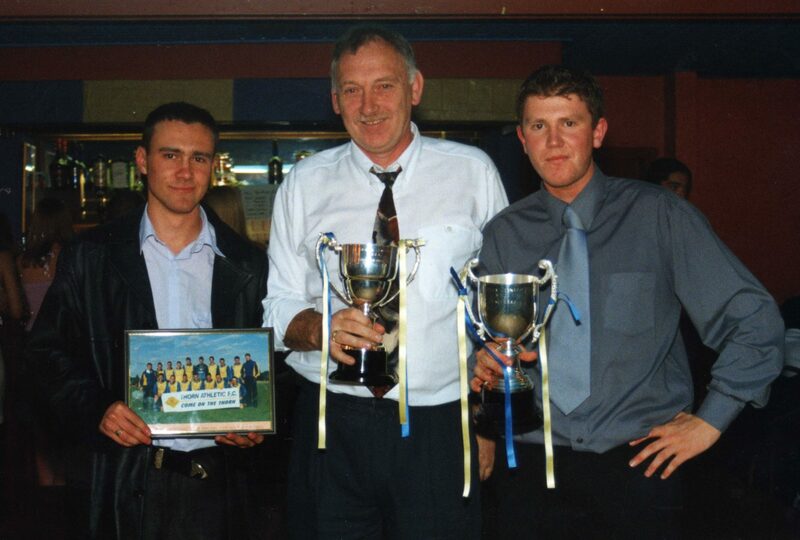 Scott Anderson, Robert Robertson and Mark McGee at a presentation night with the double. The one man who brought experience to the very earliest Thorn Athletic team as they made their way in the game with training and matches. Jim had a lengthy background in the local grassroots football scene in the eighties and nineties and his coaching input while the team was in its embryonic stage proved hugely significant in the long term. A victory in the team’s first ever match against a hugely respected Glennifer Thistle side set the tone and he was never far away to lend a steady hand in the early years. His son James was a key member of that very first Thorn team and was never far away from the club. More recently, Jim’s other son Steven has blazed a trail with the club’s first youth side and has kept the strong family link going. 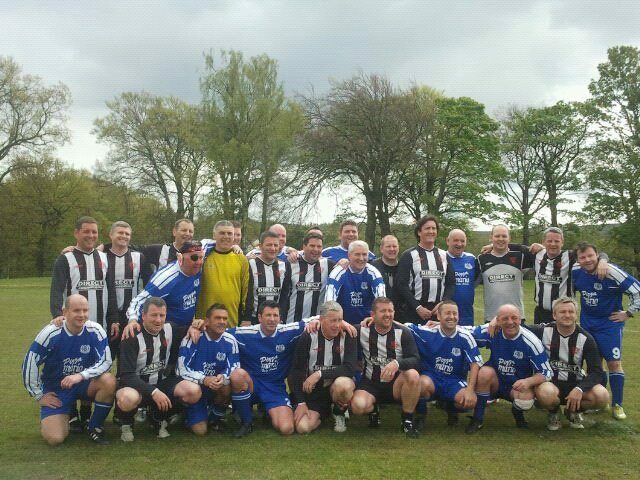 Jim, pictured centre in blue and white, at the annual charity day. A founding committee member who gave endless hours and covered many miles to ensure the team survived past those difficult early years. From the first ever training session to initial silverware and memorable Scottish Cup trips – Martin played an important role. Turning his hand to whatever tasks required to be done and provinding what he could for the players, his dedication and input, when the odds often looked stacked against the team, proved key in ensuring we made it beyond some major challenges. He shared in many of the early unlikely triumphs of the team and made a lasting impression with almost every one of the historic first ever Thorn team, which he was instrumental in forming. 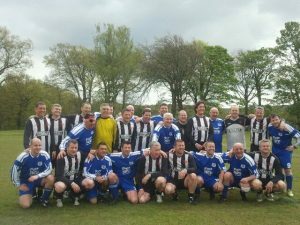 Legendary status was assured in the junior game as a player after back-to-back Scottish Cup triumphs with Largs Thistle and Glenafton. 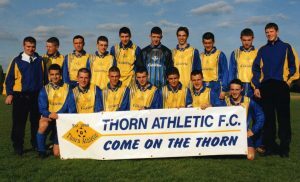 Spells with Johnstone Burgh on their run to the same final and a successful period in charge of old club Largs meant some expectation on his arrival with Thorn. That was not misplaced. He led the team into the Scottish Amateur Football League and took it by storm. He delivered back-to-back League and Cup doubles with memorable consecutive final wins at Rob Roy. Those triumphs helped blaze a trail in the SAFL and despite leaving, the team he’d built eventually went on to reach a West of Scotland Cup final which was played at Hamilton’s New Douglas Park ground back in 2011. Archie, with his backroom team of David McLelland and Colin Lindsay show off double.